I find the conclusion that there been no DNA evidence of the original population to be a bit premature. Farming societies immediately deliver large populations that easily swamp the indigenous populations. Look at the story of the meager population of nomads in Borneo and their present day absorption into the surrounding population of agro-urban man. The sheer weight of population would make their DNA signature meager. Ancient populations engaged in one form of ethnic cleansing that usually eliminated the men of a target population. It was normal to adopt the women and even the children. Thus in a single generation a superseded lifeway could be absorbed genetically. Three more generations or so and no evidence would even exist. This essentially happened to the Eastern Indian tribes in North America in the first two centuries of contact. A combination of the slave trade and intermarriage overwhelmed the original populations although they held it off for a long time. In our world we also have the myth that these populations somehow died out. The truth is that it is unlikely that this is what occurred although there are instances of localized populations overrun by disease. Besides all that, settled societies also have stable burial practices allowing archeological recovery. Hunter gatherers are not so accommodating. Just how many bones are we going to find? The answer is almost none at all. Thus archeological recovery is naturally biased. The ancestors of modern-day Europeans likely were farmers and not hunter-gatherers, British researchers said. DNA analysis taken from burial grounds suggests early farmers migrated into Europe with plants and domesticated animals and replaced Stone Age hunter-gatherers, geneticist Mark Thomas of University College London said in a release Friday. There is little evidence of a genetic link between the hunter-gatherers and the early farmers, said Thomas, who worked with researchers at Germany's Mainz University. Humans arrived in Europe 45,000 years ago and replaced Neanderthals. From then on, European hunter-gatherers experienced enormous climate change, including the last Ice Age. 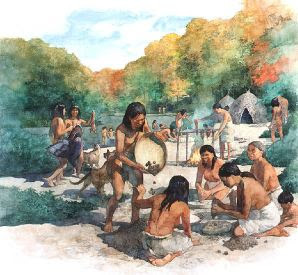 The hunter-gatherer lifestyle survived 2,000 years after the Ice Age and ended 11,000 years ago, but gradually was replaced by agriculture , without a genetic exchange between hunter-gatherers and farmers, Thomas said. In the language of the nomadic Penan there is no word for forest, it is simply their universe, and its destruction is snuffing out the ancient lifestyle of this tribe who are among the world's last hunter-gatherers. They said they are ready to stop roaming and settle in villages, giving weight to fears that the 300-400 Penan thought to still be nomadic may all be heading this way, or even that their way of life is already extinct. "Our problem is that there is just not enough to eat, there are no wild boar to catch any more," said Sagong, the headman of the group. "The companies logged all the teak already, and now they are going to clear the land for palm oil plantations," said the young chief, who brought 15 of his people to a blockade against the timber and plantation companies. "If that happens, we lose everything, we cannot survive this," he said. "Yes it is sad to leave this life of roaming. But what can we do? We have to strive for the best for ourselves. It is our fate to face this challenge." A lean and muscular man aged in his 30s, Sagong said their last hope was to join the anti-logging campaign which has escalated recently in Sarawak state, on Malaysia's half of Borneo, an island shared with Indonesia. "I came here to man the blockade and safeguard the land," he said at one of the barriers built of logs and bamboo, among seven constructed in the region in recent months to force the timber trucks to a halt. The Penan of Sarawak, who are estimated to number around 10,000, had mostly abandoned their nomadic ways and settled in villages by the 1970s under the influence of Christian missionaries. Even the settled Penan still retain a deep connection to the jungle, foraging for rattan, medicinal plants, fruits, and sago palm -- a starchy staple. Wild game are hunted with finely crafted blowpipes and poison darts. The Penan have been opposing logging for decades, but the spectre of bulldozers coming in to clear-fell what is left of the jungles has proved too much to bear. Jayl Langub, an anthropologist from the Universiti Malaysia Sarawak, said the nomadic Penan are being thrust into the modern world through contact with loggers, satellite TV, and the boarding schools where some send their children. "It would be better if they made their own decision and settled at their own pace, but these changes are coming very rapidly and I think it just overwhelms them," he said. "However much they want to remain nomadic, the changes to the landscape mean it probably would not be possible for them to continue anyway... unless they live next to a national park, or unless areas are converted into reserves." Ian Mackenzie, a linguist who has studied the Penan since 1991, said he believes that few of the fabled group of 300-400 are truly nomadic as most have taken up some farming and established base camps with sturdier timber huts. "There are various reasons for it but I would say the primary reason is that it's economically untenable to live as hunter-gatherers when their jungle has been logged three times," he said. "The end of this ancient lifestyle is a very tragic cultural loss," he said. "That's how humans were supposed to live, how we all lived a long time ago, and this is the last flicker of it gone." Mackenzie, one of a handful of foreigners to speak Penan fluently, said that any groups who wanted to settle should have as many generations as they needed to make the momentous transition. "To force them to make it brutally in a few years, it's almost beyond the capacity of human beings to make that leap. It's as if you or I were dropped down in the middle of the primary jungle and forced to survive." On a sliver of hilltop not far from the blockade, Sagong's tribe from the district of Ba Marong has constructed three sturdy open-sided huts, raised from the ground and built of saplings and bamboo lashed together with vines. In a tropical downpour that drenched the canopy and turned the ground to mud, they sat serenely with their children -- including a five-month-old baby -- who, despite these most basic conditions were clean, dry and healthy. As she played with a baby monkey that the family kept as a pet, Sagong's daughter Nili smiled and shook her head when she was asked whether she liked this life in the rainforest. "I would like to go to school," she said shyly. These days few Penan still sport the traditional bowl-shaped haircut, woven bamboo hats, brightly beaded necklaces and stretched earlobes that sometimes dangle near the shoulders. In his baseball cap paired with a purple loincloth, and bare chest marked with tattoos including Christian images, snakes and a skull and crossbones, Sagong laughed when asked about his appearance. "I'm a new generation, I don't dress like that," he said as he stood next to his father-in-law, who wore a monkey tooth around his neck, bunches of woven bangles, and played a bamboo nose flute. "For us the jungle was our bank, we survived without money. Our life depended on the sago palm and wild animals and for generations we have lived like this," said the older man, Ngau Anyi. Sagong said his own band of 27 people wanted help to establish a proper house with access to schools and medical care, while still having the chance to hunt and gather in the forest. "Our wish is to have our own village, to do farming," he said. "We see other settlements and that's what we want. We have to spend a lot of time building huts and moving around. It's a hard life." The plight of the Penan was made famous in the 1980s by environmental activist Bruno Manser, who waged a crusade to protect their way of life and fend off the loggers. He vanished in 2000 -- many suspect foul play. Manser lived with a group of nomadic Penan from 1984 to 1990 and learnt to speak Penan as well as how to survive in the jungle, while gathering a huge amount of botanical and cultural information. "We have been accused of being against development, of wanting to keep the Penan in a museum," said Lukas Straumann, director of the Bruno Manser Fund, which continues to campaign for the people of the rainforests. "Maybe there was a little bit of truth to that. But what we hear from the Penan is that they want development, to participate in modern life, but it has to be development at their own pace."